Happy New Year to you all. 2012 was a great year and thank to everyone who has continued to support me, I feel very lucky that this is my 7th year of being a a full time professional artist, and still going strong, and I couldn’t be where I am without all of you who choose to buy my work so a big thank you. And I hope my paintings bring you daily joy. 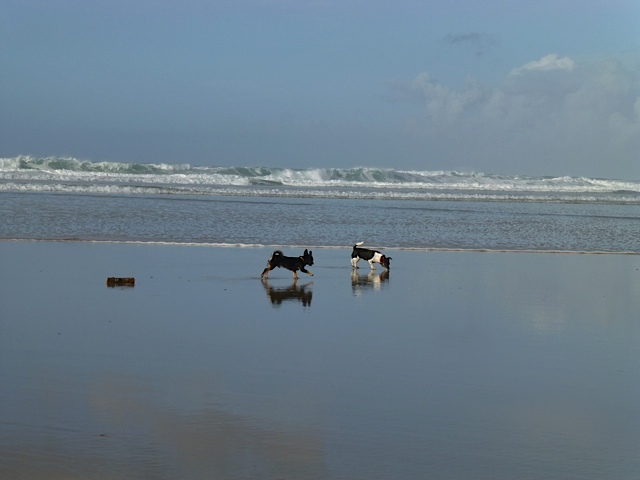 The weather has been very dramatic this month and especially when my fiance Scott and I visited Cornwall for a weekend of inspiration with our gorgeous dogs. It was just before the heavy snow and it had been pouring with rain until we reached the glistening shores of a Perranporth, Cornwall. The sun burst though the cloud and Monty and Tilly went bonkers running around in the surf creating mirror images of themselves in wet silver sand. A perfect way to start the year and fire me up with fresh new ideas. I am particularly drawn to the colours of this photo and already I have began creating a painting inspired by this day out.